took a day off from work today. staying at house, starting my new project - hantaran arrangement - the most favorite part of all. haven't finished the previous project yet (bunga pahar) actually. the polystyrene base is wrapped with the sponge and fuchsia pink satin, so it looks like a pillow. combination of flowers are used as additional decorations to make the overall arrangement more lively. i liked it so much until i decided to put the small beads randomly on that "pillow". i don't know where the idea came from, but with the hope of injecting a "diva" look to the hantaran, it ended up looking funny. terasa tau, nampak macam jerawat -_-"
tapi sebab yang satu ni dah ada jerawat, yang lagi lapan pun kena lah ada jerawat juga. we are now in the process of distributing our wedding invitation cards to let ppl know that they are invited. i don't know about how others see it, but it makes me feel kind of special to know that i am included in the list of someone's wedding guests. haha it may sound pathetic, i know, but that's me. this is just a quick update to update everyone, as if i am a famous blogger LOL. it's 3am in the morning, new pimples are coming out like everywhere due to lack of sleep. went to visit a friend. she had her son's majlis aqiqah today. arrived at her house very late that we can straightly enjoy the served meal. his name is muhammad rizq naqiuddin. born at week 35th of pregnancy, he is now about 2 months old. never had a chance to visit him before (sorry zila!). congratulations again to zila & azwan. i have got a few things to sell right after the wedding. i am not sure about the outfits. i might want to keep them for months before i can decide whether to sell them (because i know that i can't fit into them in the future) or to keep them (so that i can show them to my granddaughters). but there are couple of things which i would like to sell for some reasons. maybe there is no use for me to keep them. or maybe there is no extra space for them in my room. i am too lazy to snap pictures of the goods. but i will provide some descriptions of them along with their cost price and selling price. you are free to book from now but they are available to be picked up only after 24th of april 2011.
i'm about to order bunting for direction signage from ubunting. i'm done with the artwork when suddenly my fiance said to me, "nanti nak pinjam guna balik untuk kenduri i." ala tapi tapi, i want to put the date and also my parents' name on the signage. the artwork looks like this. aww.. i'm proud with my own artwork design. tapi tu la, his idea seems brilliant. since i will be using a durable type of signage (bunting type), it would be better if i can fully utilize it and use it twice instead of once. but how to design a signage that can be used for both events? this is the finalized artwork design for button badges that will replace the corsages on my wedding. ppl said, virgo's are very practical. i find it impractical to spend on corsages which will be thrown away right after the wedding. and that's why i chose to have button badges for petugas at my wedding. young ppl can keep it and make it into one of their accessories, e.g. put it on their bags or whatever. the adults can give it to their children or they are always welcome to keep it too! phew. i feel so relieved to know that i had settled another item in the checklist. next, finding vendor that can provide me cheap bunting for direction signage. look what i've got for myself! yeayy another spa voucher from milkadeal. the deal is simply irresistible, i can't help myself but to buy it. but i need 8 more people to buy it before the deal is confirmed. so lovelies, what are you waiting for. don’t spend another second thinking about it, just grab this deal! the voucher is to be redeemed at S spa, mont kiara. must find time to go there. get yours at milkadeal, now! 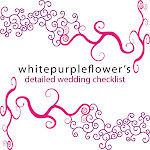 a wedding checklist can be a big help in the process of preparing a wedding. or if not, you may overlook some important elements of the wedding. 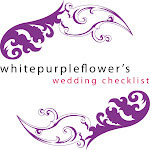 my previous wedding checklist was quite comprehensive which you may have a look in this entry. the list consists of things to do BEFORE & DURING the wedding. 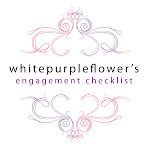 although i already have that comprehensive wedding checklist, still, it is not enough. i need a more detailed checklist to help me to stay in track along the process. for example, i forgot to include the corsages and direction signage in that checklist. and also small but vital things such as parking space, kompang, or any of other little details that will make the wedding so special. so here it is, the detailed wedding checklist of mine. do not do or plan to do everything at the very last minute. the best is to do as much as you can far in advance, so that you won't get too stress when the day is approaching. get enough rest especially a week before the wedding day. perform empowerment, ask your family or friend to help you. doakan semoga majlis saya berjalan lancar dan diberkati, amin. *checked item tak semestinya dah fully settle. tapi either in progress or booked or bought or discussed or ordered or maybe more than halfway done. me & my fiance went to matta fair 2011 on sunday, yesterday, march 13th. luckily my friend had warned me on the heavy traffic around pwtc area. so we decided to park his car at sentul lrt station and took lrt from there to pwtc. it has been a while since the last time i use public transport. i traveled using public transport practically everyday during my stay in germany. ohh i missed germany so much (off topic). can't wait to have an mrt station at saujana impian, kajang. ceh macam lah nak naik, but it is just too near to my house. managed to get a 3d2n flight & ground package to kuching, sarawak. we were there for 4 hours before i decided to grab that package. ohh i hate crowded places. there were just so many ppl, i can't think straight. i couldn't use my mind effectively. too many choices so it was harder for me to decide on which is the best deal. and it was difficult for me to make a research in a very short period and just by using his iphone. the screen was too small, ohh maybe i need an ipad (hint). initial plan was to have a beach escapade since i love snorkeling and would enjoy watching undersea views. but with the tsunami things that just happened, i tried to stay away from beaches, or islands to be exact. i have never been to kuching or any part of sarawak before. another reason for why i chose sarawak. can anyone provide me info on what are the top hotspots and tourist destinations in kuching, sarawak? ohh tau boleh google, saja gedik tanya sini macamlah ada orang nak jawab. i cried watching videos of tsunami in japan (blame the hormones). if you're a malaysian in japan, kindly inform the malaysian embassy that you're safe - +81334763840. the malaysian foreign ministry operations room to monitor the situation and to help malaysians in japan - 03 8887 4570/4770 and 03 8889 2746/2830. spread the news if you have family members or friends over there. my prayers and thoughts are with all malaysians in japan. and for all in sabah/labuan, stay away from beaches. we only get married once in our life. yeah in some cases it might be twice or more, but that's different story. so, in order to make sure that the wedding will be a successful event, the preparation itself is an exhausting long process. it needs hard work and p.a.t.i.e.n.c.e., patience! me myself, at times i do feel extremely stress. everything is so tiring, but i just have to bear with it. deep down inside, i wanted everything to be perfect, but i am lacking in terms of resources, financially & physically. to hire a reputable wedding planner would cost a lot. so i chose to organize the wedding by myself in an attempt to save my parents' money. i have to handle every detail that needs to be handled. things get difficult when i am a very detailed person, and fussy. family drama is another thing. sometimes i forced myself to tolerate on things that i actually did not agree or like. suffice to say, i just want this to be over. i said to myself, "it will be over before i know it", every time i felt so stress. "everyone went through the same process and they have successfully made it, so it is nothing big". "finish all these, i have a whole lot to look forward to!". "at the end of the day, everything will be over. no use for me to obsess over the details". haha so now i am sharing with you my motivational quotes. you can use it if you want :P it works tau! thank God there is nothing bad going on between me and my fiance. yelah, orang cakap masa bertunang banyak dugaan, banyak bergaduh. but alhamdulillah, practically, we didn't. small-small fight tu tak kira lah, itu sejam je paling lama. i am lucky to have a partner who can easily say "i am sorry" and doesn't have time for fights LOL. but i know, when the wedding is over, i'm going to miss it. i am going to miss the preparation process? are you kidding me? most ppl told me the same thing. or it is just in theory? or ayat sedapkan hati? LOL. whatever it is, i am trying to enjoy it. presenting the maid of honor of my wedding day, one of my best-est friend, dila anuar. she will be helping me dress on my wedding day and calming my nerves. she is among the first person that i will turn to for help and advice. due to that, she deserves a gift to let her know that i appreciate all the things that she will be doing and the time she will be spending for me on the most important days in my life. since daily stress really takes its toll on me & dila (she's a busy working lady), i decided to bring her to spend some time for a spa visit. look what i've got for us. yeyy! an indulgent spa visit at eve de beaute, the strand, kota damansara. and i bought it for two! to dila, thank you for agreeing to be my maid of honor. i hope you'll like the gift. and all the kain-s as well! pss the great deal was bought from milkadeal! you can bring your husband with you. or bring your maid of honor, just like me. your mom ke, your sister ke, siapa-siapalah. the voucher looks so yummy. 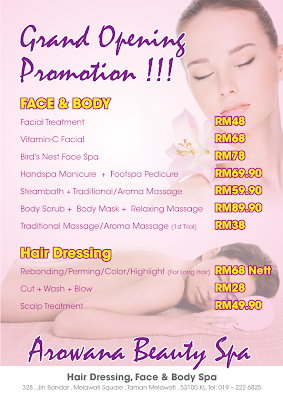 85% discounts on a package of body massage, steam bath and facial treatment. normal price is rm236, so i can save more than 200 bucks. i was about to buy this voucher from mydeal when i suddenly feel like googling on the spa. until i found this in their blog. haishh they lied on the normal price. 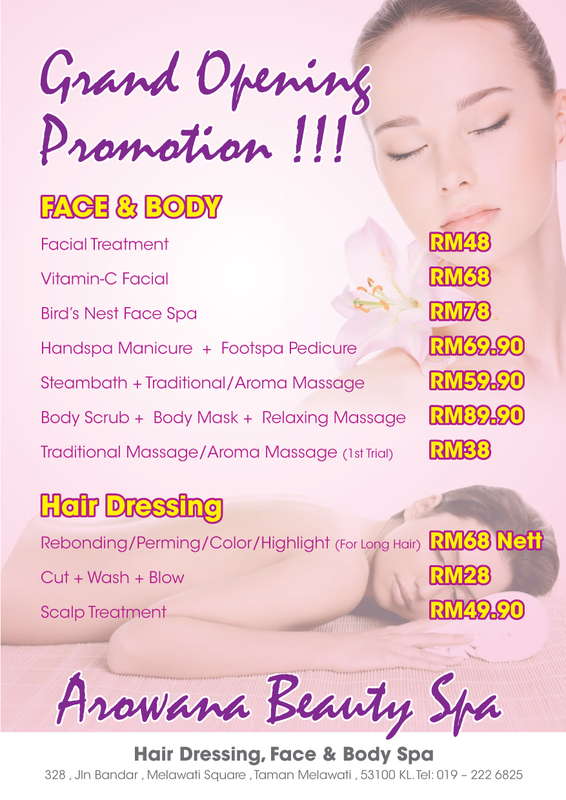 steam bath + body massage is only rm59.90. and facial treatment is only rm48. so where did the normal price of rm236 came from? okay, maybe that's the grand opening promotion price. famous blogger, thepinkstilettos, also reviewed on a deal that she bought from mydeal in this entry. it was clearly stated in the deal she bought that "yummy! edible honey and chocolate used in the facial". but then, she got a different type of facial. i know that the goods and services in mydeal are provided by the partners and not by them. but i think they have to be more alert with information provided by the partners. information which is displayed in the dealsite must be accurate. they have to do thorough checking on their partners so the customers won't feel cheated on deals offered by them. in terms of dealsite layout and deals, i would prefer milkadeal. they have language options - english or malay. the writeups on partners and deals are more exciting to read. and they have a discussion room where buyers can discuss on anything e.g. recent deals, previous deals, etc. the best part is they offer rm5 milkadeal credit if we login through facebook. and they will give us rm10 milkadeal credit when someone you invite/refer gets their first coupon. milkadeal is a genius dealsite, no? "Fadlee & Aishah" vs "Aishah & Fadlee"
okay lovelies, i need your help. is it weird if i chose to have "Fadlee & Aishah" written on the cover of the invitation cards instead of "Aishah & Fadlee". i mean, the cards are for walimah at my place but i prefer to put his name first. on the cover tau, bahagian dalam macam biasa je my name first. 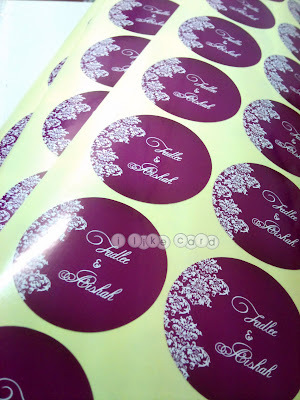 my sister commented on the sticker tags, why "Fadlee & Aishah" and not "Aishah & Fadlee". i don't know why, but i like it to be that way. i deliberately put it that way because i wanted it to be that way. but when ppl questioned me on that, i started to rethink. orang tauhu tak yang i sengaja buat macamtu atau orang akan ingat i tersilap? yes, ilikecard is the chosen vendor for the invitation cards, and also for the sticker tags. so far, i am very much satisfied with their service. especially in terms of PR. it is so good, i have nothing bad to say. i chose them because i really like their work. their previous works are amazing, which you can find here in their portfolio. and i came across few of good reviews about them over the internet. all this time, i am dealing with faizah. she is a nice girl, never complained on her fussy client. yes, i am the fussy client of her. for those who are still searching for the right vendor, i am recommending ilikecard to you. you will never regret, insyaAllah. we are now the official agent for sinar inspirasi muslimah apparel. unfortunately, we are yet to upload the pics on our webstore. there are three types of muslimah apparel in our collection. the non-exclusive one (with codes of BM), the exclusive one (with codes of IM) and collection for kids (with codes of BK). the price is only rm40 for all BMs, rm45 for IMs, and rm38 for BKs excluding postage. postage charge is rm7 (flat rate for west/east malaysia). you can order them through me by sending me email at aishah_ara@yahoo.co.uk at the moment. once they are up on our webstore, you can place order through the website as usual. okay then, have a nice day!